Only works on NVidia, sorry...I had some bytes left...if popular demand says so, I can try to make a compatible version. I'm still in Norway for a week, but Duck and I might try to get together with some other guys this week...if any of them have nvidia I'll surely take a look. ...and thanks Unc for the screenie!! Thank you, and yes, I know :) Look at the shaders in Magnus...it's fixed there. This was left to save space, and due to time etc I didn't update it after I got the music small enough. Well, looks like I must release a final :P I'll try to have it working soon. Also, psonice, ATI doesn't allow frag shaders with no vertex shaders (or at least it used to be this way). So, readding those decimals etc. might be a waste of time...but I'll see what I can do :) . It's my favorite fractal, the burning ship! 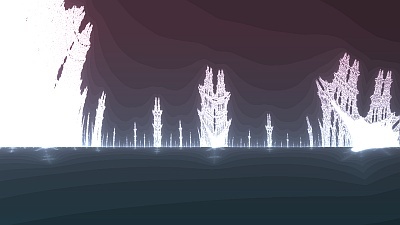 nice vlsiauls for a 1k fractal effect. thumbs up. @devreci: The shaders are typically stored as _source code_ within the exe. GLSL/HLSL source will almost certainly be possible to write in a more compact way than the equivalent shader assembly code in most cases. ehhh i'm probably giving myself too much credit, it rules either way! The credits are wrong, this intro uses Crinkler 1k and not Crinkler 1.2. Milk and cookies go to Rune for the miscommunication between us. cool and with music, but short! rulez added on the 2010-04-09 20:13:48 by chenmy! cool 1k. Could have been longer, and zik a bit better. video capture would be nice. page created in 0.016920 seconds with 15 queries.